In this category, there’s a huge range to choose from on the market. We have two dedicated showrooms on Abbey Street showcasing all types and sizes of refrigeration. Here’s a quick guide to the basic types of refrigeration. Fridge freezers – They come in a variety of colours and sizes. Shown below are our most popular models. Fridge Freezers – do defrost automatically, but some have to be defrosted by you once a year. 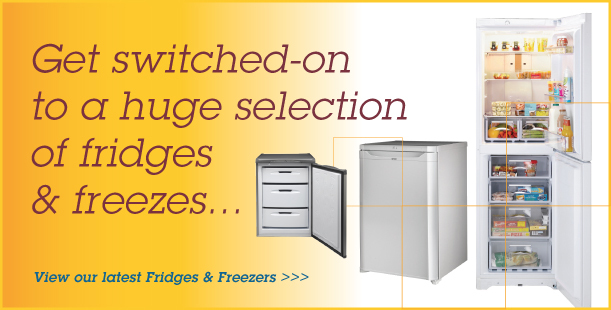 Larder Fridges – defrost automatically. Ice Box Fridges – defrost in the fridge section but you have to defrost the freezer section once a year. Freezers – some do and some don’t. The main reason for the variety is that the frost free workings take up space in the freezer area so some models are designed to offer more space instead. If you’d like more advice on selecting a Fridge or Freezer why not call us or visit our Showroom, we’re always happy to help!